Janelle looks absolutely stunning on the May cover of Essence magazine! She is not only a great talent, but is an inspiration, a beauty, and a leader in so many ways! The black and white uniforms that she wears are amazing and I love the way that they re-design her look into a new style while always maintaining the black and white theme, her "work" uniform as she calls it. Essence had an event in her honor, to help celebrate her cover and lifetime achievements and attendees such as Emil Wilbekin, June Ambrose, Iman and others were present to help honor, Janelle. Way to go, Janelle! 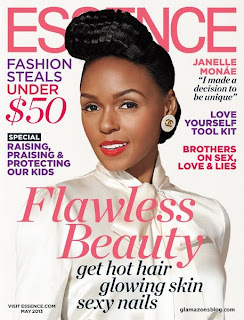 During her speech, Janelle talked of many things that have helped her along the way and you can read what Janelle somewhat describes as her true "essence", in an excellent article here written by Jessica (Founder) of Glamazon's Blog.